Train to Busan is a crazy train ride with zombies. It delivers on everything the trailer promised – and then some! We’ve been pretty excited to watch Train to Busan, which should come as no surprise since we talk about our love for Korean horror and thriller movies every chance we get. This new zombie horror thriller from Korea does not disappoint and is an instant new favorite. Unlike some other Korean movies, which can take a while to get started, Train to Busan is much like the train itself; Relentless in its motion and simply unstoppable! Still, it doesn’t compromise with all the things I love about Korean plots, which primarily means there’s always time for character portraits and development. What I tend to love about Korean movies, is the fact that characters tend to be very well rounded. No one – with the very appropriate exception of children – gets to be completely good or bad. At least not without still offering the audience some sort of explanation. Train to Busan has been described as a “World War Z meets Snowpiercer” – a description we embraced after watching the trailer – and that holds very true to the plot itself. It’s a movie about zombies and takes place on a train, which makes the comparisons pretty obvious. Also, I loved those two movies, even though they admittedly both had some issues. This one, however, takes the good parts of them both and combine them. Also, you have to love the fact that a solid critique of how the government chooses to handle this sort of crisis is very clear. Especially the cover-up and lies that are perpetuated at the beginning. In a valid attempt to avoid an all-out panic, mind you, but still. However, just like in most apocalyptic movies – especially those dealing with zombies – it’s neither the zombies nor the government, you need to fear. As always, it’s the uninfected and scared very “normal” people, who turn out to be the biggest threat. In the fight for survival, the most primitive instincts take over. For some people it’s uniting in a pack and fighting back, for others it’s being selfish and fighting only for your own survival. And this is at the very heart of Train to Busan. Some people learn and others never do… but this being a Korean movie and not (yet!) a Hollywood remake, there’s no justice or fairness in who survives and who suffers the truly gruesome deaths. Train to Busan has a bit of a lull somewhere around the middle. But, instead of getting boring, this is when the characters get a chance to figure out what’s worth fighting for. Also, it has to be said, that while we’re following quite a few characters, the father (played by Yoo Gong from The Suspect/Yong-eui-ja) and daughter are at the center of the plot. The storyline never faulters on that premise. The fact that we have an entire baseball team on board the train doesn’t change this. Especially since we only really follow two of the people from that group. Though all of them are important when it comes to fighting the zombies off. The zombies themselves are nothing out of the ordinary – as far as zombies go – on a visual level. However, they move in a crazy way. Almost beautiful and elegant like dancing. But, you know, also pretty damn creepy since it’s more of a “Pop & Lock” kind of dance. The choice to make the zombies move in this very specific way could in part be due to writer-director Sang-ho Yeon having previously worked with animation. Whatever the reason, it works really well and offers something new. 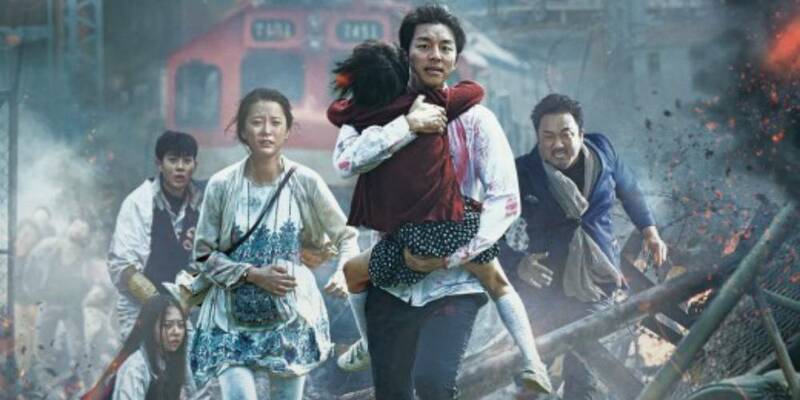 Train to Busan (Original title Busanhaeng) premiered in its native South Korea on July 20, 2016, and is breaking records with an impressive opening weekend. On July 22, 2016, it premiered in the US, and throughout August Train to Busan will be released in various countries around the world. Meanwhile, it will also continue to play at film festivals. If you get the chance to watch this one, you definitely don’t want to miss it!